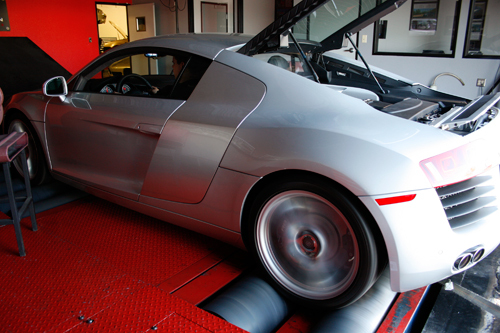 Power is measured at 4 wheels on our Mustang 500 SE AWD dyno in a controlled environment for accuracy. Dyno runs shown are the average runs of a 10 run sample group for both the Baseline and [EVOMSit] modified runs. Dyno runs are accurately run with the same RPM start point, same transmission gear, same octane fuel and same cool down time in-between runs. Measurement was made with 1 x 65,000 CFM main cooling fan in the front of the vehicle with 2 x 5000 CFM “spot” cooling fans directed at the side intake scoops. Dyno room temperature was 84.2 degrees Fahrenheit for both sets of run groups and fuel grade was 100% pump 91 octane AZ grade oxygenated fuel.